Save Time Organizing Your Holiday Party! Holiday parties are more FUN when more people pitch in - whether they are class parents, family, co-workers, volunteers, you name it! 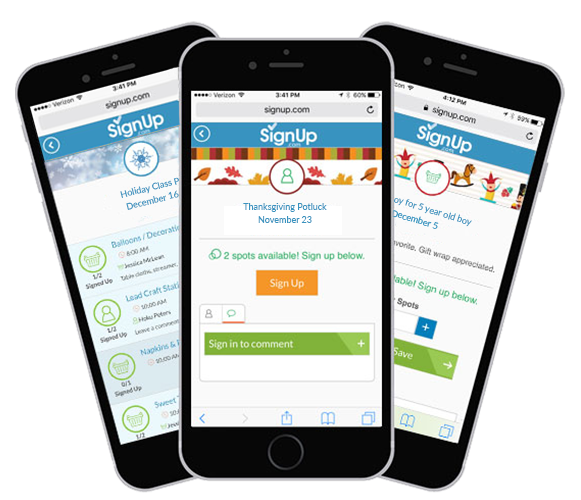 Boost participation at your next potluck or celebration with free, online SignUps from SignUp.com. Build your party SignUp in minutes, invite participants and parents via email or social media (they never need a password!) and rely on eCalendar syncing and automated reminders to keep everyone on track.
" Within 1 day of creating my class party SignUp, 9 people had signed up to bring snacks and decorations! Thank you SignUp.com for making party planning so easy! "